Senator Tom Cotton (R-ARK) recently challenged the perpetual talking point used to rationalize taking away American jobs to give them to H-2B Visa holders. A lot of the arguments for this kind of program boil down to this: No American worker will do that job. That is a lie. It is a lie. There is no job that Americans will not do. If the wage is decent and the employer obeys the law, Americans will do the job. And if it’s not, they should pay higher wages. To say anything else is an insult to the work ethic of the American people, who make this country run. Sounds like “Make America Great Again” – President Donald Trump’s rally call – but the White House apparently wasn’t listening to Cotton and was also forgetting the campaign promise to increase employment of this nation’s residents. On Monday Mr. Trump launched his “Made in America” campaign, and at the same time authorized 15,000 additional H-2B Visas, just to make sure that the “greatness” doesn’t extend too quickly, if at all, to the working class. This H-2B program had allowed companies to bring in up to 66,000 foreign workers annually. instead of recruiting and hiring Americans. The program is supported by both establishment Democrats and Republicans to lower wages for Americans and increase business profits. “This is what it does, it takes jobs away from American workers and abuses the immigrants that come into this country,…it is a new form of indentured servitude,” Cotton said. American workers already face competition from roughly eight million illegal immigrants, and the Visa programs just make it worse. Visa workers cannot change jobs and are bound to employers who can abuse them without recourse. The program means companies don’t have to pay a premium to hire Americans for seasonal overtime work that leaves them unemployed in winter, and it also reduces pressure on the companies to recruit and train youths and marginalized Americans, including millions of Americans who have fallen out of the workforce. The imported workers are also paid at rates that are lower than needed to attract Americans to those jobs — which also means that the companies can pay lower wages to their full-time American workers. 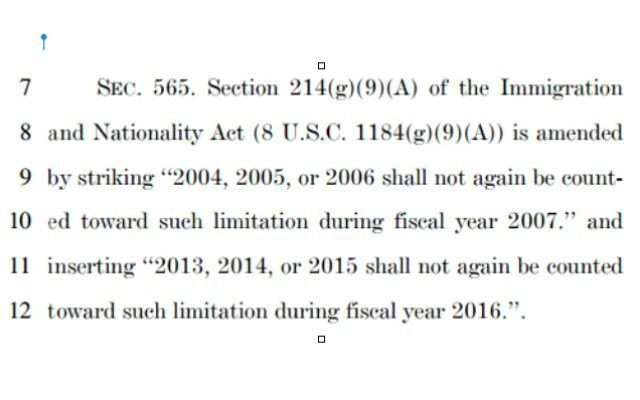 This increase in H-2b Visas this year is just the beginning of a program to vastly bloat the labor market with foreigners. The new measure was pushed by a bipartisan coalition in late 2015 that included Sen. Barbara Mikulski (D-MD), Sen. Mark Warner (D-VA), Sen. Thomas Tillis (R-NC), and Sen. Bill Cassidy (R-LA). In strong opposition to the expansion was an unlikely trio of Sen. Bernie Sanders (D-VT), Richard Blumenthal (D-CN), and Jeff Sessions (R-AL). “A 120 percent increase over the normal annual cap of a so-called seasonal visa program for temporary workers that can take up to nine or ten months is not necessary. It has nothing to do with funding the government, nothing,” Cotton said. The hidden language exempts the prior three years of H-2B workers from the cap, allowing the companies to bring in four years of workers each year. That will gradually quadruple the size of the current program to 264,000 workers in 2019. So much for replacing American workers with special job skills. If you can breathe and speak English, come on down! While some companies use the H-2B program to hire lifeguards, carnival workers and maids, others use it to import engineers, tax preparers and occupational therapists — “jobs that clearly are not unskilled and not so exotic that no Americans can be found to fill them,” Vaughan wrote in an analysis of H-2B data.